6. Using this stand-up portable desk as a stand-up portable computer office desk, speaker's podium or study desk for children. " 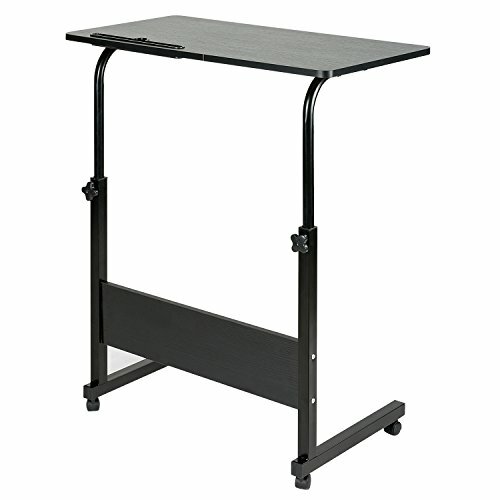 Size of this Adjustable Laptop Stand: 31.5" length x 15.75" width x 27.95"- 38" height. This is a real multifunction table, you can use it as standing workstation, overbed or sofa table, a good student study table or drafting or craft desk. The tary side table can be moved to anywhere with the universal wheel which can be locked to fix at the bottom of this end table. The DOEWORKS stand laptop desk is eqqiped with slot to put IPAD or kindle which can release you spine and neck.